Okay, so I'm starting this review off by confessing something. When I saw this new series of 30-minute, creation-based DVDs, I was pretty excited. Until I saw that the first one in the series was about The Grand Canyon. The second one, on Yellowstone and Grand Teton, sounded intriguing. But the Grand Canyon? Ugh. I've read or see so much about the Grand Canyon already and I just couldn't get excited. I requested both, though, because I knew my kids would be interested. When my package arrived, it contained only The Grand Canyon. I was disappointed. And my oldest rolled his eyes. He didn't say it, but his body language spoke volumes: "Really? You expect us to watch something else about the Grand Canyon?" 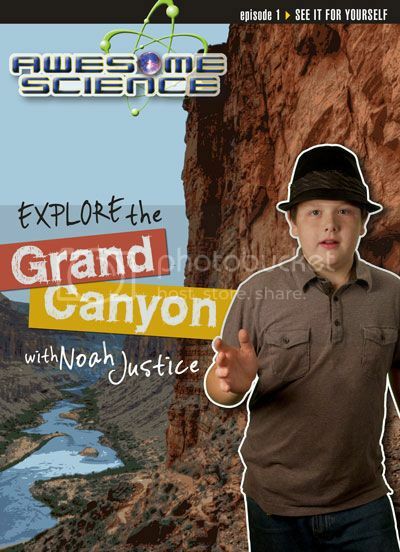 The cover -- where Noah Justice looks cut-out and pasted in -- didn't inspire either of us, despite the publisher's blurb, which commented on how Kyle Justice (Noah's dad) "has produced video which has appeared on networks including National Geographic, ESPN, and the Outdoor Channel." I determined I wanted to get this review over with, so we popped in the DVD. Thankfully, the bad attitudes were limited to my eldest and myself. He buried his nose in a book, intending to pretty much ignore the DVD. I kept my computer open so I could at least check Facebook statuses. As we watched however, Connor ended up setting down his book, and I closed my computer. This video is simply fabulous. Noah presents all kinds of information, much of which I've heard before, in an engaging style. The film footage is phenomenal. And things are explained in a way that is easily comprehended -- or at least it was by everyone age 7 and up in my household (Trina, the 6 year old, enjoyed it but didn't quite grasp some of the content). I also received a study guide that turns this into something we can watch again and again, looking at different aspects each time. The study guide is 34 jam-packed pages of vocabulary, additional information, discussion questions, and bonus activities that lead you deeper into the various topics. According to the website, there will be 13 DVDs in the series. In addition to the ones I mentioned above, there is one out on Meteor Crater and Petrified Forest, and titles on Yosemite & Zion National Parks, Mt. St. Helens, and John Day Fossil Beds will be released in the fall. Check it out. There is even a group at Creation Conversations dedicated to this series. Disclaimer: I received this DVD/Study Guide set for free from New Leaf Publishing Group. No other compensation was received. The fact that I received a complimentary product does not guarantee a favorable review. I just heard about this series listening to a Creation Today podcast and was intrigued. I can't wait til my own blog merits me a free copy too;-). Kyle Justice sounds just like an old pastor of mine and the idea of his 14 year old son hosting a series sounded really good, so I thought I would check it out and ended up running into your review. Reviews like yours that are honest make a big difference on whether I end up spending money on a resource or not. Thanks!